Last updated by Shari Harley at January 21, 2019 . Several years ago I hired a vendor that wasn’t a good fit. Try as we might to work together, we didn’t communicate well. Everything was a struggle. After a frustrating few weeks, the owner of the business offered to refund my money and amicably part ways. His company had already done work on our behalf and I didn’t want to lose momentum. I turned him down. That was a mistake. When a small business owner, who needs your business (money), tells you to go elsewhere, listen. We parted ways a few months later in a much more costly and less amicable way. 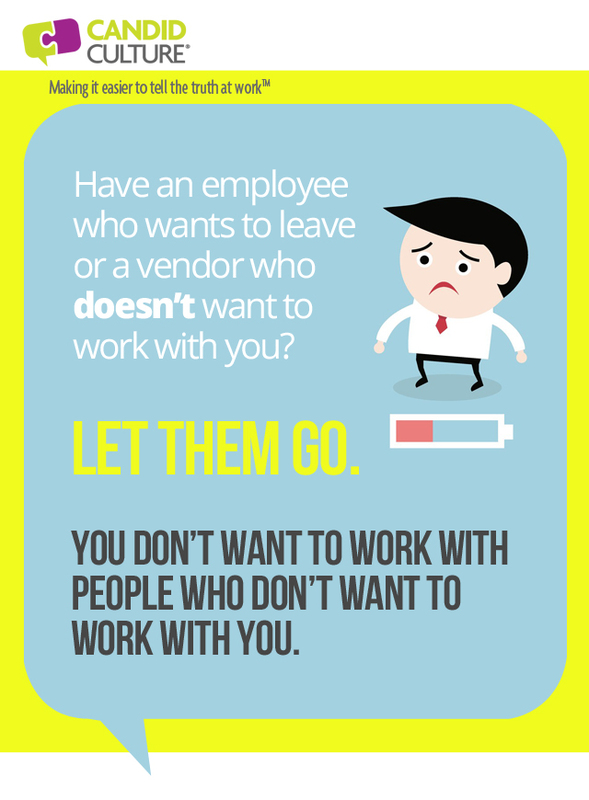 You don’t want to work with people who don’t want to work with you. The same is true for friends and romantic relationships. Don’t chase people. If they don’t want you, move on. There are lots of other people who will see your value. There are differing schools of thought on whether or not you should try to retain unhappy employees who quit. I’d be interested in seeing statistics on how long employees who quit but are then retained, stay with an organization and how well they perform. I’d let them go. Again, you don’t want people who don’t want you. The challenge is that most people are afraid to speak up in organizations and relationships (of all kinds) when they’re unhappy. Unhappy employees typically quit versus make requests and give feedback. The antidote is to create a culture in which employees, vendors, and customers openly make requests and talk about what is and isn’t working. Create a climate of candor in which feedback is exchanged regularly versus just during exit interviews, which is too late. You’ve had several open discussions and can’t meet each others’ needs. If you don’t have a job the employee wants, that’s a good reason to part ways. It’s not a good culture fit. You talk and talk but don’t communicate. Issues don’t get resolved. Frustration is the norm. This is also a good reason to end a working (or personal) relationship. Discuss employees’, customers’, and vendors’ needs and requests at the beginning of working relationships. Agree upon what success and a good job looks like. Ask lots and lots of questions, and listen closely to the answers. Ask for feedback regularly. Conduct a weekly plus/delta (a discussion of what is and isn’t working) during which all parties are invited and expected to speak freely. The more you have these discussions, the easier they will be and the more candid people will become. Address challenges as they come up. Discuss challenges that can’t be fixed. If a relationship isn’t working, end it sooner rather than later. Be slow to hire and quick to fire. There are lots of talented vendors and employees. Find employees and suppliers who are easy to work with (for you) and who can meet your needs, and vice versa. If you can’t meet each others’ needs or the relationship is a constant struggle, those are good reasons to move on. Don’t chase.